Two Gloucester boys were featured in the 2019 Boston St. Patrick’s Day Parade on Monday. 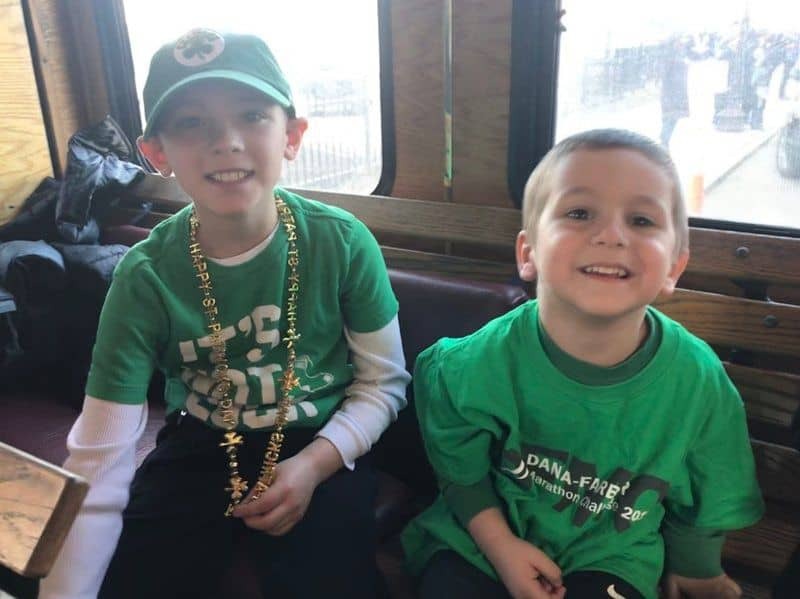 Mason Adams and William Bren were featured in the Cops for Kids with Cancer trolley as it rolled down the streets of Boston in the annual parade. The nonprofit Cops For Kids With Cancer supports pediatric cancer patients at Massachusetts General Hospital, offering emergency assistance to families, events for patients and their families, and special “wishes” for teens who are too old to be served by the Make-a-Wish Foundation. The two boys attended the parade with family. Mason was recognized for donating all of his birthday money to Cops For Kids With Cancer after his 6th birthday in 2017. Mason, who considers police officers to be his personal heroes, decided that he would prefer to give money to the police rather than receive presents for his birthday, so his parents raised $900 in his name to donate to Cops For Kids With Cancer. Mason was thanked by Gloucester Police and presented with a formal citation by Mayor Sefatia Romeo Theken recognizing him for his selflessness. William is battling kidney cancer and had a kidney removed last year. The Bren family visited Gloucester Police last August after a convoy of police cruisers escorted William and his family to the police station. They were presented with a $5,000 donation from Cops For Kids With Cancer to help cover William’s medical expenses. Will’s father, Craig Bren, works in the city harbormaster’s office and is a U.S. Coast Guard veteran and reservist. “Will and Mason are two very unique and very special Gloucester children, and while they may consider cops to be their heroes, in reality, they are heroes to us and they inspire us every day,” Chief John McCarthy said.